In the draft I had first made, I had used the expression “Con stitutional Assembly” My intention was that the assembly which was to be convened would from the very first be endowed with full powers to alter the governmental system. But, because I did not or could not explain this expression with sufficient clearness, they pointed out to me from Sivas and Erzerum that the people were not familiar with it. To all Vilayets; To Autonomous Livas; To the Officers commanding Army Corps. The formal occupation of the metropolis by the Entente Powers has disorganised the national forces of the State, that is to say, the legislative, the executive and the judicial power. The Chamber of Deputies has been dissolved through the Government having been officially informed that under prevailing conditions there is no possi bility for the deputies to perform their duties. 1. An Assembly, furnished with extraordinary powers, will meet at Angora for the purpose of conducting and controlling national affairs. 2. The persons elected as members of this Assembly are subject to the same legal conditions that apply to deputies. 3. The Livas will form the electoral constituencies. 4. Five deputies will be elected in each Liva. 5. The elections will take place in all the Livas on the same day and at one uninterrupted sitting of a committee consisting of electors of the second class, who will be chosen by the Kasas belonging to the Livas ; of electors of the second class in the chief places in the Livas from among the administrative and local councils in the Livas ; of the leading committees of the Defence of the Rights in the Livas. In the Vilayets it shall consist of the central councils of the chief places in the Vilayets ; of the general councils of the Vilayets ; of the local councils of the chief places in the Vilayets, of the elec tors of the second class in the chief provincial towns, in the chief towns in the Kasas, and of the electors of the second class in the Kasas belonging to the chief town. 6. In the same manner that each party, group and union may chose candidates, so every one individually has the right in his constituency to put forward his candidature and thus actually take part in the sacred struggle. 7. The elections will be conducted by the highest official of the town in which they take place, and he is held responsible for the regularity of the election. 8. The elections shall be conducted by secret ballot and there shall be a clear majority. The result of the polling shall be controlled by two persons nominated by the committee and in their presence. g. A protocol shall be drawn up giving the result of the elections in triplicate, and attested by the signature or the personal seal*) of all the members. One copy shall be kept in the town, the second shall be handed to the successful candidate and the third sent to the Assembly. 10. The expenses incurred by the members shall be settled later on by the Assembly. Travelling expenses, however, are to be guaran teed by the local authorities and determined by the electoral committee, based on the unavoidable expenses that had been incurred. 11. The elections shall be finished so that within a fortnight, at latest, the majority of the members will be able to meet at Angora. The members are to leave immediately, and the result of the elections, as well as the names of the members, shall be communicated forthwith. 12. You are requested to inform us of the hour when you receive this telegram. Note: For the information of officers commanding Army Corps, the Vilayets and the independent districts. During the course of the week I put myself into personal telegraphic communication with the deputies who came to Angora from different directions. They were given information calculated to raise their spirits and allay their unhappiness. Nobody was left in Stambul who could have represented our ideas there. As for those who, in spite of the warnings we had been sending them in different ways for many a month, had not formed any or ganisation as we had instructed them to do and had worked for the “Karakol” Society, their leaders had been sent to Malta and their adherents in Stambul had given no evidence that they were still active or even any sign that they were still alive. In order to form a new organisation, I would have been obliged to make very exhaustive efforts to spend more money than our financial position at that time would allow. In the course of my general remarks I have spoken several times about the question of my election as President of the Chamber of Deputies in Stambul and my intentions about this. I have already pointed out that in this attempt I met with certain difficulties and the plan did not succeed. *) The possession of a personal seal was customary by law, because many persons were unable to read or write. conspiracy and had broken up, I hesitated for a moment to call the deputies together and undertake to form an assembly, particularly of the nature I have described. Let it be understood that I did not know whether Djelaleddin Arif Bey, President of the Chamber, would come to Angora. I thought that in case he might come there, I would wait for him and let him call the Assembly himself. But the situation required an urgent and quick decision. I did not think it prudent to lose any time in expecting an improbability. But at the same time, in order to secure the execution of the decision I had to make, I was obliged to put myself in telegraphic communication with all the commanders, and I spent several days in obtaining their opinions and listening to what they had to say. No. 34. Angora 27 th March, 1920. To the Honourable Djelaleddin Arif Bey, President of the Chamber of Deputies. Duzje. The formal and actual occupation of Stambul by the English, which has subjected the power of the State to slavery and oppression; the attack on the Chamber of Deputies by which a great mistake was committed in assailing the independence and honour of the nation; the impossibility thereby imposed on the representatives of the nation of fulfilling their duty on questions concerning the fate of the country; the necessity in which they found themselves of taking refuge behind the nation; all these events have made it necessary to call together an Extraordinary Assembly which shall have the administration of the State and the Nation under their authority and in their control. No doubt you have been informed that the Representative Com mittee has decided to convene an assembly provided with extra ordinary powers at Angora, and that orders have been sent every where for this purpose. We think it advisable that you should take notice of the com munication of the 19 th March that was sent out with this object, that you should confirm it and that you should express your opinion on this matter of public interest in a short proclamation, so as to hasten the elections and the meeting of the assembly. Duzje 27 th March, 1920. I have not read the proclamation of the 19 th March to which Your Excellency refers. Although it would be well to convene an extraordinary assembly, it is necessary that it should be constituted as fax as possible according to law. It is true that our Constitution does not provide for anything like the meeting of such an extraordinary assembly, but it is helpful in this case to refer to the provisions of other Constitutions. Thus, for example, the French Constitution provides that if the Chamber were to be legally dissolved or had been attacked, the members of the Chamber who had been able to escape should assemble in a suitable place with members of the councils of departments or arrondissements two of each from every council and discuss the necessary plans for the re-opening of the Chamber, and in this manner overcome the effect of the attack made upon it. The decisions arrived at by this assembly are lawful, and any one who does not obey them is liable to be accused of high treason. As a matter of fact, I had these principles in my mind. My opinion is that when I arrive at Angora, after I know on what principles the proclamation of the 19 th March is based, a new proclama tion must be drawn up. We shall discuss this later on. If we analyse the wording of this telegram carefully, we can easily see that there is a considerable difference between my point of view and that of Djelaleddin Arif . When I resolved upon the meeting of an assembly provided with extraordinary powers, I was well aware that our Constitution did not contain any provision for such an assem bly. But in order to arrive at my decision it did not occur to me to think whether such a provision existed or not. On the contrary, I had intended to organise an assembly of a totally different character and endowed with other powers, and with it to overcome the successive stages of the revolution that I had in my mind. For these reasons, I abandoned all hope of finding a possi bility to bring our conceptions between which I had no doubt there existed a very strong difference into agreement by discussing them. Nevertheless, I had my proclamation of the 19 *& March communi cated to Djelaleddin by telegram. Duzje, 28 th March, 1920. To His Excellency Mustapha Kemal Pasha, Angora. The Representative Committee s proclamation of the 19 th – March has been brought to my notice. In their general form, the contents of it agree with the principles which I personally hold. It is natural, therefore, that on my arrival at Angora, after we have discussed the details, another proclamation will be drawn up. I am obliged to stay at Bolu to-morrow, but shall leave in the evening for Angora. I send you my best respects. _ . , . , ,. A ..
President of the Chamber of Deputies. Although Djelaleddin Arif Bey states that after having taken notice of our proclamation he finds its contents agree generally with the principles that he holds, he does not immediately draft a pro clamation confirming the first one. He postpones doing this till he has arrived at Angora and discussed the question. When Djelaleddin Arif arrived at Angora rather lengthy conver sations and discussions on this question took place with him and some lawyers. But, unless I am very much mistaken, Djelaleddin Arif Bey never agreed with me about the character and the extraordinary powers of the National Assembly. 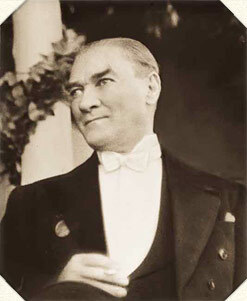 He always maintained that the chief task of the Assembly which had just met consisted in guaranteeing that the meeting of the Chamber of Deputies would take place in Constantinople, and he always looked upon himself as the President of this Chamber. Let me refer to a little incident that comes to my mind and which confirms what I have just said. of remuneration and in his capacity as President of the Chamber of Deputies had demanded the emoluments attached to his office. You axe aware that at that time there was no difference between the remuneration of the President, the Vice-president, the other chairmen and the members of the Assembly. Djelaleddin Arif Bey alone, in his position as President of the Chamber of Deputies, claimed that an exception should be made in his case, and spoke of his lawful right to demand a higher salary. I declared that this question could only be raised at a full sitting of the Assembly and that it must be referred to it. Djelaleddin Arif Bey doubted whether he could weather the storm that would un doubtedly be raised in the Assembly, and so he abandoned his claims. The elections began to take their normal course seriously and rapidly all over the country, according to the instructions issued on the 19 th March. A certain amount of hesitation and reluctance was felt only in certain places, for a longer or shorter time according, to the individual localities. At last the deputies from all the electoral districts, representing the whole country and nation, were present without exception at the Grand National Assembly. The places which originally intended to stand out were Dersim, Malatia, Konia, Diarbekr and Trebizond. I must call your attention to the fact that it was not the inhabi tants of these districts who showed hesitation and reluctance, but the higher civil officials who were there at the time. As soon as they once understood the real position, the people no longer hesitated for a moment to identify themselves with the will of the nation. Let us consider once more some of the main events which, so to say, are the natural consequences of a revolution. In a telegram in cipher, dated the 29 th March, that I received from Selaheddin Bey, commanding the III rd Army Corps, we had been informed that the attitude of the 15 th Division at Samsoon was doubtful and that “some officers entertained strong feelings towards the Sultan. ” It was reported that certain officers had appealed to their superiors and had told them that they would not obey any orders that were antagonistic to the Sultan. It was also said that they would resign their commissions if pressure were put on them. Newspapers and travellers who came form Constantinople were reported to have said that the buildings that had been commandeered were completely evacuated on the second day after the occupation had begun, that Saiih Pasha s Cabinet was continuing its work and that the Senate was sitting ; that during the last Selamlik the usual cere monies were performed as usual in the presence of the Minister of War and the Minister of Marine, and so forth. “There is nothing out-of-the-way in putting an officer under arrest here, but if this should occur now it might lead to a march against Anatolia. “I do not know what the conditions of service in the national forces are at the Smyrna front. I believe the men are paid. “As it is quite natural that in case war breaks out the whole of the population cannot be paid, I feel sure that on the day following the outbreak of hostilities there will not be a trace left of the national forces. On the other hand, Selaheddin, commanding the III rd Army Corps, in obedience to instructions I had given him, had arrested a certain English officer, Captain Forbes, attached to the Control Com mission, who had come to Amasia. Another English officer had arrived at Samsoon. He had written to Selaheddin Bey and had demanded that Captain Forbes should be set free immediately, with out a moment s delay, and sent to Samsoon, and had stated that if this were not done he would be held responsible for the consequences. “I have not arrested Forbes. It has been done by the nation whose capital has been occupied in complete disregard of the terms of the armistice and the laws of humanity. Consequently, it is the nation alone that can decide about his release.” But Forbes did not remain under arrest; they were content to expel him. We were informed in a short telegram in cipher from Haider Bey, Mutessarif of Bolu, that the bridges near Tshatal Kopruler, a place situated between Ada Basar and Hendek, as well as the bridge at Medreni Su, had been destroyed by the enemies of the national forces. 24* Another telegram in cipher of the 9^ April, sent from Duzje by Mahmud Nedim Bey, commanding the Bolu district, brought us the news that manifestations had taken place against the national forces on the previous day at Ada Basar, that the telegraph and telephone lines between Hendek and Ada Basar had been cut, and that the Abasas of Duzje, who had hitherto remained neutral, had decided to join our opponents. We also learned that the destruction of the large bridge at Medreni Su, between Hendek and Ada Basar, was the cause of the communications being interrupted. When we received these messages we drew the attention of Mahmud Bey, commanding the 24 th Division at Geiveh, to the state of affairs. We were also informed that a branch of the Society for the Revival of Islam had been formed at Nev Shehr under the presidency of Nedim Bey, Kaimakam of Nev Shehr. According to the report we received, eight of the most intriguing members of this Society had been called to Nigdeh. The members of this Society declared that they would never recognise anybody but the Sultan, and swore to sacrifice all they possessed in money and men to exterminate the national forces. Apparently they met every night. Their leaders had been arrested by a detachment from the division stationed at Nigdeh, which had been sent for that purpose by the commanding officer. We shall see from the sequel that a great number of similar in cidents occurred. While we were working to secure the opening of the Grand National Assembly which engaged our attention more than anything else, the waves of reaction and revolt in the districts of Duzje, Hendek and Gerede, lying in the zone of Bolu, began to spread and seemed even to approach Angora, via Nalli Han and Bey Basar. Endeavouring in one direction to restrain these waves, I thought out other means to save the deputies who assembled at Angora, and who were not yet sufficiently informed about the situation, from a spec tacle that could easily put them in terror, and to avoid a possibility that this could produce and become serious enough to prevent the meeting of the Assembly. With all this in view, I exerted the utmost energy to make certain that the Assembly would open. We finally decided to be satisfied with the delegates that had been able to come and to open the Assembly on Friday, 23 rd April, 1920.